I start with my cast iron skillet. Any skillet will work, but just remember the darker the skillet the darker your product. 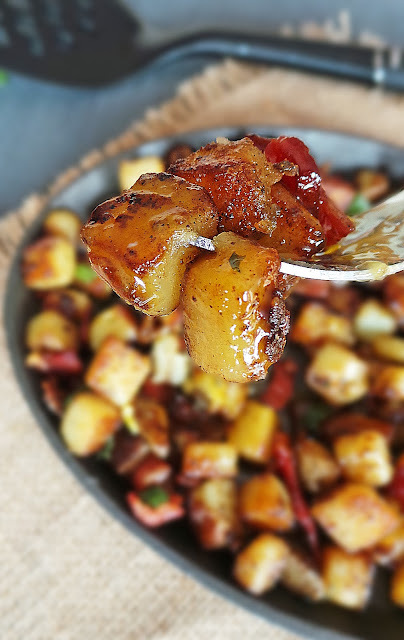 Dice up the potatoes, toss them in minimal olive oil, and cook them up until nice and brown. Just as the pan is au sec, or nearly dry, throw in some diced raw bacon. Dicing raw bacon can be a pain and I’ve seen some resulting knife cuts, so just before your potatoes start to cook throw the bacon in the freezer! Dicing frozen bacon will change your life. Forever. The bacon will render which will further cook the potatoes and add a whole new level of flavor. Speaking of flavor, I season my potatoes with salt, pepper, and Old Bay. The key is to lightly season throughout the entire cooking process, that way you build flavor. Before you do anything, freeze your bacon slices that way when you're ready to prep, it'll be so much easier to chop! In the meantime, heat 1-2 tablespoons of oil in a large skillet over medium-high heat. Tilt the skillet so the oil spreads evenly. Once the oil is hot, drain the potatoes and add to the skillet. Season with salt, pepper, and Old Bay as needed. Cook for 10 minutes, stirring the potatoes often, until brown. If needed, add a tablespoon more of oil. Chop up the bacon and add to the potatoes. The bacon will start to render and the fat will begin to further cook the potatoes. Toss it up a bit! The bacon will take 5-6 minutes to crisp. Once the bacon is cooked, reduce the heat to medium-low, add the minced garlic and toss. Season once more. Add dried or fresh parsley. Control heat as needed. Just before serving, drizzle over the maple syrup and toss. Let that cook another minute, giving the potatoes a caramelized effect. Serve in a warm bowl with a sunny side up egg! This served 3 people in my household, easily bump up the amount of potatoes if serving more! If turkey bacon is preferred, add a little more oil throughout cooking process. 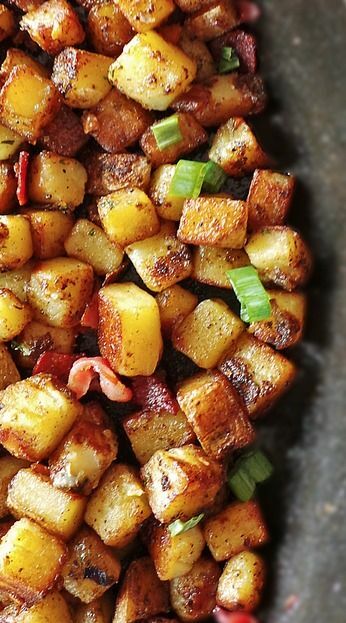 Red potatoes work well too! 0 Response to "BANGIN’ BREAKFAST POTATOES"